Evleaks once again has came up with something spicy to attract the market. My friends Google is about to release its smartwatch soon this year. The senior vice president of Google Sundar Pichai also mentioned about the wearable Android SDK. And we are here to discuss its some of the specs that got leaked. According to the leak the smartwatch will be designed by LG and manufactured too. Let’s see what the specs that are being provided. Besides if you are thinking of the battery life, it is still confidential. No leaks has been made on Battery but the source hopes that it will take time to drain. On other hand 4GB storage is more than enough for a smartwatch. And 512MB RAM it the smartwatch you can do whatever you what, multitasking and if it supports game then go for it too. Comparing the Google Smartwatch to the latest Samsung Gear 2 that we saw was announced in MWC 2014 had same specs as compared to Google smartwatch. Besides the resolution provided in 1.63” inch watch was 320 x 320. 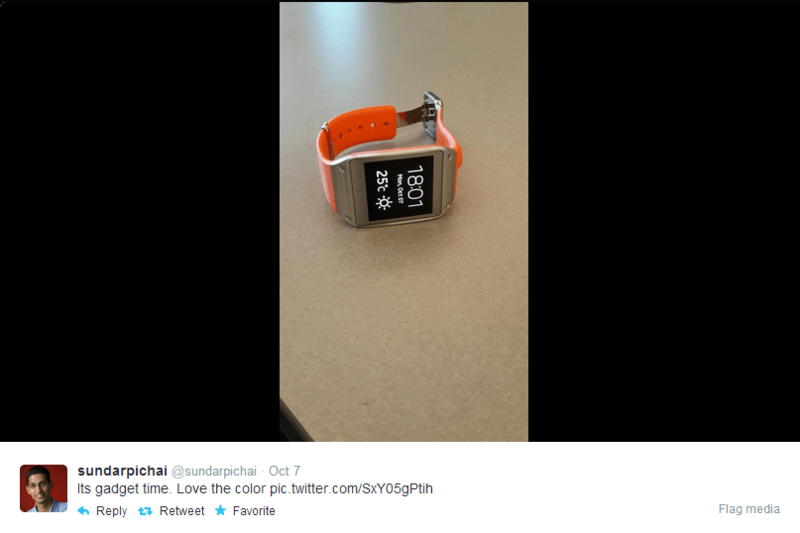 Well what we are saying about this smartwatch is a leaked rumor. Google defiantly would be providing something better in order to beat Samsung and Sony in the smartwatch race. What was not included in this complete package was about the processor used in the smartwatch. We hope they don’t introduce quad core but something better than that’s provided in the Google Glass. What we suppose is that this was the only reason why Nexus 5 was again designed by LG. They were looking ahead of some of us and were looking at the future of smartwatches. What do you thing about this leak, will Google be beating Samsung and Sony with their new Smartwatches? Will there be more specs introduced? What specs you hope to see in future in Google Smartwatch and what is your favorite feature in any of the Companies Smartwatch and how much you like it? Please don’t hesitate to tell us by commenting and mailing us.